Fr. Jerome Murphy-O’Connor, O.P., passed away peacefully on Monday, November 11, 2013. He was 78 years old. Fr. Murphy-O’Connor taught for more than four decades at the École Biblique et Archéologique. He was a world-renowned biblical scholar and author of numerous books on St. Paul and the Holy Land. Many throughout the world counted him their friend. A funeral Mass will be celebrated at the Basilica of Saint-Etienne, Jerusalem, Wednesday, November 13, 2013 at 12h00. You are invited to join in prayer with the Dominican brethren and members of the École Biblique, along with teachers, students and researchers. « O beatum virum, cujus anima paradisum possidet! Unde exsultant angeli, laetantur archangeli, chorus sanctorum proclamat, turba virginum invitat: Mane nobiscum in aeternum! » (Antiphon for the Benedictus, Feast of St. Martin de Tours). Commentaires fermés sur + Fr. Dr. Jerome Murphy O’Connor R.I.P. + Fr. Dr. Jerome Murphy O’Connor R.I.P. Frère Jérôme MURPHY O’CONNOR O.P. Jerome Murphy-O’Connor’s death on the 11th of November 2013 is mourned not only by his brethren of the Ecole Biblique in Jerusalem and the Dominican Order but by his many friends in all parts of the world. To them he was ‘Jerry’. To his family he was ‘Jim’, baptized James after his birth in Cork, Ireland, on 10 April 1935. Educated by the Irish Christian Brothers in Cork and the Vincentians at Castleknock College, Dublin, he entered the Order of Preachers, whom he knew from his home parish. The name Jerome, which he was then given, turned out to be prophetic of his future academic career and ministry as a Dominican. In appreciating Jerome Murphy-O’Connor the scholar and writer, it is important to know something of the man. He was a big man in physique and temperament, in his youth an ardent rugby player – he followed the game with intense interest all his life – who had a reputation for being able to take and give hard knocks. Later he became a keen hiker. He applied his energy and determination to intellectual effort, but never tired of walking around the Holy Land with a curiosity that was always able to find something new and share it with companions and readers. He enjoyed ‘laughter and the love of friends’ and found in their company and conversation the challenge of questions and fresh points of view. It is also important to reckon with the Irishness of Murphy-O’Connor. He had the characteristically Irish delight in the play of wit and language, in storytelling, and in vigorous argument. He also shared the destiny of so many of his compatriots to live outside their native land. After initial studies in the Dominican House of Studies at Tallaght, Murphy-O’Connor was sent to the University of Fribourg in Switzerland, where he was ordained priest in 1960 and obtained a Doctorate in Theology in 1962 with a thesis published under the title Paul on Preaching. At least with hindsight the subject indicated two of the major orientations of his life, towards Pauline studies and to practical and pastoral concerns. His education was continued at the Ecole Biblique in Jerusalem. There he discovered the Holy Land as well as learning the techniques of critical Biblical exegesis. Pierre Benoit had his eye on this bright young student and forestalled or overrode objections (including Murphy-O’Connor’s own reluctance) to have him aggregated to the faculty of the Ecole – the first whose native language was not French. The idea then was that he should specialise in Qumran, so he went to Heidelberg to study the Dead Sea Scrolls under Karl Georg Kuhn. He went on to Tübingen, where he came under the influence of Ernst Käsemann and discovered Bultmann and an existentialist interpretation of the New Testament and in particular of Paul. Returning to Jerusalem in 1967, Murphy-O’Connor taught and published on Qumran, but soon realised that his deeper interest lay with Paul. In any case, no one could accuse Murphy-O’Connor of neglecting the duties of academic life. He was an assiduous and demanding teacher at the Ecole and the author of many books and articles, mostly academic but others more popular or pastoral in orientation. Two books sum up his contribution. In Paul a Critical Life he was able to synthesise forty years of work on Paul’s life and personality as well as on his writings, and to express his personal (and sometimes controversial) opinions. In The Holy Land: An Archaeological Guide, which has accompanied many travellers, he passed on his knowledge of the country he had explored ‘from Dan to Beersheba’ and especially of Jerusalem. He held honorary Doctorates from the National University of Ireland and from Notre Dame University, Indiana. La primera vez que hablé con el padre Jerome Murphy O’Connor, sentí que el trabajo que estaba comenzando a realizar cargado de ilusión no llegaría a su fin. Llevaba unas semanas en Jerusalén, el profesor Emile Puech, que estaba guiando mi investigación con seriedad y rigor –así trabaja Émile Puech- me sugirió que hablase con Murphy-O’Connor. Él había estudiado los manuscritos del Mar Muerto desde la perspectiva del cristianismo primitivo, desde los escritos paulinos. Nos citamos en el último banco del pasillo central del edificio mayor de l’École Biblique. Todavía no había llegado la primavera a la Ciudad Santa, pero el padre Jerome llegó en manga corta, con una camisa de cuadros de lo más secular. Me miró y me dijo: Te conozco, eres el “qumranita” de Salamanca. Te he visto merodear por la biblioteca con los originales manuscritos de Roland de Vaux. sonriese y comenzase un nuevo discurso. Vamos a ver –afirmó con voz solemne-: Émile me ha dicho que quieres hacer la tesis sobre el Serek de la cueva 1. Me parece bien. Pero sabes qué quieres hacer y para qué. Recuerdo que no me dio tiempo a responder a sus preguntas. Iba a responderle cuando irrumpió sin dejarme hablar: Haz la tesis sobre el Prólogo (1QS 1,1-15). Está sin estudiar en profundidad. 1) Ahí tienes trabajo desde el punto de vista paleográfico: (Émile Puech te ayudará, lo sé) para reconstruir las lagunas de las dos primeras líneas. Puedes aportar tu reconstrucción. redaccionales, haz tu propia traducción del texto. 3) También tienes trabajo desde el punto de vista exegético: interpreta lo que el autor quiso decir, lo que dice y lo que no dice. Mira el Prólogo como lo último que se escribe del documento legal pero, sobre todo, como un abstract de la Regla. dado. Pero omití lo más importante, lo que debía haber dicho: hice esta tesis porque me la sugirió Jerome Murphy-O´Connor y porque después de aquella mañana de primavera, Émile Puech y José Manuel Sánchez Caro me ilusionaron y orientaron un trabajo hasta el final. Hoy, cuando me entero de la muerte de Murphy O’Connor, siento un vacío lleno de tristeza. Tengo la impresión de que algo de mí se ha ido con él. Siempre había considerado a José Manuel Sánchez Caro, a Émile Puech y a Florentino García Martínez, mis maestros en la literatura de los Manuscritos del Mar Muerto. Pero hoy, al rememorar las veces que tuve la suerte de conversar con Murphy-O’Connor, descubro que la terna era, en realidad, de cuatro grandes maestros. Pido al Señor que permita al padre Jerome seguir ensenado en el Reino, la Jerusalén Celestial y que sea, como lo fue a nuestro lado, el mejor guía de la Ciudad Santa. 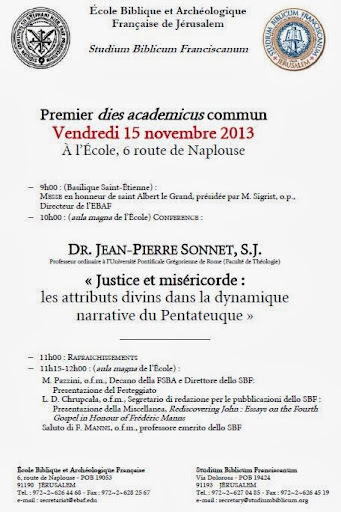 Commentaires fermés sur Dies academicus le 15 novembre 2013: une première! Dies academicus le 15 novembre 2013: une première! Premier dies academicus commun avec nos frères et collègues franciscains du Studium Biblicum Franciscanum de Jérusalem. Une année sur deux, il se tiendra le 15 novembre, fête de saint Albert-le-Grand, a l’Ecole biblique et archéologique, l’autre année il se tiendra le 7 novembre, Bienheureux Duns Scot, au Studium biblicum franciscanum.